When Gordon Willis, dubbed by fellow cinematographer Conrad Hall “the prince of darkness,” shot The Godfather, he deliberately underlit Brando’s face to preserve Don Corleone’s mystery – so we couldn’t read his soul through his expressive eyes. 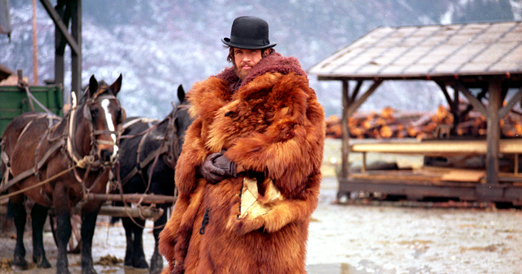 Vilmos Zsigmond obtained the muted, textured look of McCabe & Mrs. Miller by flashing, i.e., overlaying fog on the film stock. Roman Polanski, working on his first American movie, Rosemary’s Baby, got William Fraker to shoot Ruth Gordon on a bedroom phone so a doorway cut off part of her profile, and Fraker reports that the audience tipped their heads collectively to try to see around that doorway. These anecdotes are part of the fun of seeing Visions of Light: The Art of Cinematography, a documentary by Arnold Glassman, Todd McCarthy and Stuart Samuels that operates like an enthralling ninety-minute course in the history and techniques of photographing movies. McCarthy, who compiled the script, interviews some two dozen cinematographers, including many of the major American and émigré European ones who were still around in the early nineties (the movie’s focus is almost exclusively on Hollywood), whose impressions of the work of their precursors shape the film’s historical perspective and whose reminiscences bring it into the modern era. This personal-history approach, and the precision and articulateness of the commentary by, among others, Conrad Hall (In Cold Blood, The Day of the Locust), Allen Daviau (E.T. ), Michael Chapman (Taxi Driver, Raging Bull) and Vittorio Storaro (Apocalypse Now, The Last Emperor) gives Visions of Light a dynamism and integrity that compilation documentaries – movies about movies – almost never have. The talk doesn’t feel like filler between the fabulous clips; the clips are actually in the service of the arguments the photographers want to make. The picture begins with a respectful tribute to the work of the silent masters – Billy Bitzer on the D.W. Griffith movies, Karl Strauss on Ben-Hur, and so on – that’s defeated by the filmmakers’ choice (their only stupid, one, but it’s a dilly) to run the clips at sound speed, which is one-third again as fast as the original projection speed. It’s difficult to admire the beauty of this footage when it’s garbled in this way, even though the prints themselves are obviously the finest ones available. Most of what the cinematographers say about the way they work and about the development of their craft is fascinating. They cover the sudden catapulting into sound, before camera technology was ready for it; how cameramen, working in studio machine shops to find ways of solving new problems, carried that technology forward; the seal the lab put on the distinctive style of the studio it served, and how the trademark sensibilities of certain photographers transcended that style; the contribution of cameramen to the images of stars (like William Daniels, the only man Garbo ever allowed to shoot her). Daviau talks about the philosophical shift that was necessary for cinematographers trained in black and white, which is naturally more abstract and theatrical, to make when they began to work in color (which was pioneered in the thirties and became more widespread in the forties). You think about the implications of that remark when you see Hall’s work in In Cold Blood or Chapman’s in Raging Bull (or, though it’s not anthologized here, Gordon Willis’s in Manhattan), which, though brilliantly achieved, feels very self-conscious – the effort of artists accustomed to working in color who are reaching back toward a palette history has discarded. The photographers who went backwards toward an earlier period through their modern vision of the world, and of movies – as Storaro obviously did in The Conformist, or Zsigmond in McCabe & Mrs. Miller – are much more successful. (Zsigmond’s commentary on McCabe is a little skewed, however. He talks about desaturating the color, according to Altman’s wishes, to get the faded look of old photographs, but a lot of the images I retain of the movie – which may be the most breathtaking job of cinematography ever accomplished – are overpoweringly lush and fervid, such as the drenched greens in the opening shots of Warren Beatty’s entrance into the town on horseback. In the late sixties, American movies, influenced by the New Wave and other European filmmakers, became more visually free (though, as Daviau points out, Orson Welles and Russell Metty had blazed that trail in Touch of Evil, as far back as 1958). Laszlo Kovacs discovered America in Easy Rider, inventing cheap ways of getting what he gathered on film as he traveled. Hall talks about how – in the mode (though he doesn’t say so explicitly) of every art form in the twentieth century – cinematography began to embrace what earlier eras would have labeled underlighting (in Fat City), light reflected on the lens (Cool Hand Luke), and heat blurriness (The Day of the Locust). Nestor Almendros explains how the new sophistication in lighting equipment and light-sensitive film stock began, in the seventies, to permit cameramen to realize what in earlier films had had to be faked: he juxtaposes one of his scenes from Days of Heaven (1978), lit by kerosene lamps, with one from Sunrise (shot fifty years earlier by Charles Rosher and Karl Strauss), where the lamps, supposedly lighting a search party on a fogbound river at night, are merely props. Incidentally, the interviews McCarthy conducted with Almendros and Haskell Wexler, who took over for Almendros on Days of Heaven, clarify what a moviegoer is unlikely to have picked up alone: the subtle discrepancy between the techniques the two men employed on their individual sections of the picture. You might quarrel with the odd omission; amid the praise for the heroes of the studio era, like Citizen Kane’s Gregg Toland, I wish someone had credited Joseph Walker, whose collaboration on the Frank Capra movies was some of the most beautifully sustained work of its time. (And when Daviau wonders aloud what movies Welles and Toland screened while they were preparing for Kane, you spot a gap in his phenomenal knowledge of the history of cinematography: in The Citizen Kane Book, Pauline Kael traces the visual links between Kane and Toland’s own earlier Mad Love, starring Peter Lorre.) I could have lived without the clips of Victor Kemper’s assaultive photography in New York movies like Midnight Cowboy and Dog Day Afternoon. The section on The Conformist, which makes you want to rush out and take another look at it, cries out for a comparative montage of the techniques that, Visions of Light asserts, Storaro amassed from earlier movies. But if you want more from this film, that’s because it gives you so much; it starts your brain spinning. I’ve always been puzzled by Mike Nichols’s early reputation as a director; the glimpses here of Who’s Afraid of Virginia Woolf? and The Graduate reminded me that, starting out in the mid-sixties, he allied himself with first-rate photographers (Haskell Wexler, Robert Surtees) who made him look good. The choice of clips in Visions of Light is more than just informative, though – it’s thrilling, especially since so many of them are surprises. Since Stanley Cortez shot Welles’s The Magnificent Ambersons, I might have guessed someone would cite his formidable work in The Night of the Hunter. But I was amazed and delighted to see a wonderful scene from Clarence Brown's 1931 melodrama Possessed (Oliver T. Marsh, photographer) I thought no one else had ever come across but me, where small-town girl Joan Crawford watches a train glide by slowly, peeking hungrily into each compartment as it passes as if she were watching a movie. 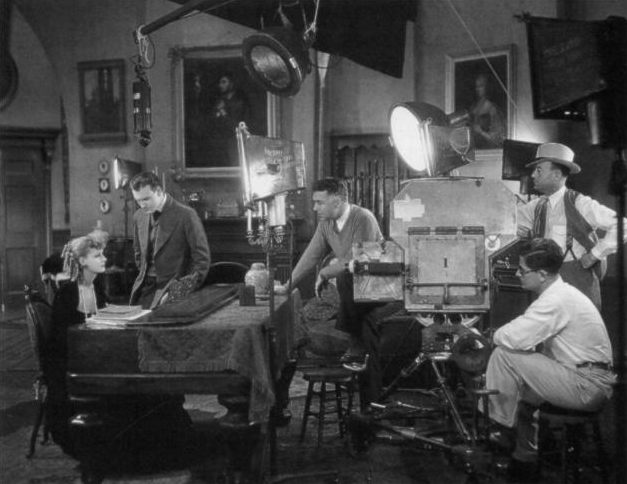 (It’s one of the truly magic moments of early-talkie filmmaking.) And, never having seen the film noirs John Alton shot in the ‘40s and ‘50s, I had no idea how resourceful he was. The finale of The Big Combo, included here in its entirety, is lit by a single searchlight within a rectangle cut out in the middle of the frame. It’s a virtuous piece of lighting, like something in a Welles picture. You have an almost irresistible urge to applaud.